It was always going to happen … was just a case of when. My mother has three of my 17 goslings on her land, and they live – awkwardly – with her hens. Not in the henhouse, but they have the same Fort Knox enclosure for when she isn’t there to police them. One morning she went to visit them. She could see the hens crowded round something. They were fluffed up and shrieking. She said she’d never heard them like that. As she got closer, she could see a goose in the ring. It was pecking at something, but she couldn’t see what. As she rounded the corner of the enclosure, she realised what was going on. The goose had a hen held down under its substantial foot, and was pecking and jabbing at it. It escaped with its life … this time. But there’ll be another. There always is. 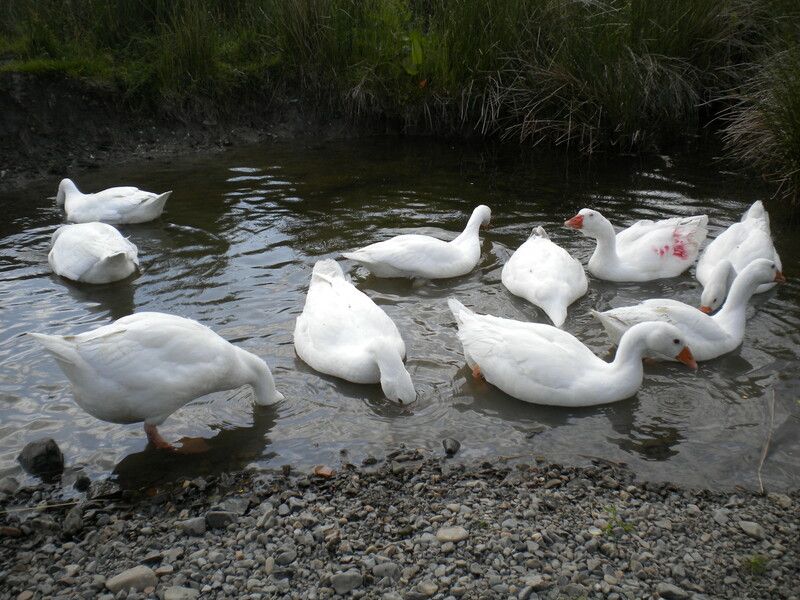 Gosling pictures, now they have settled into their home. The world outside is terrifying, but once they’ve got used to my presence (it helps if you get down on their level), they relax very suddenly, pecking at my over trousers and the nearby new hay, chatting all the while. 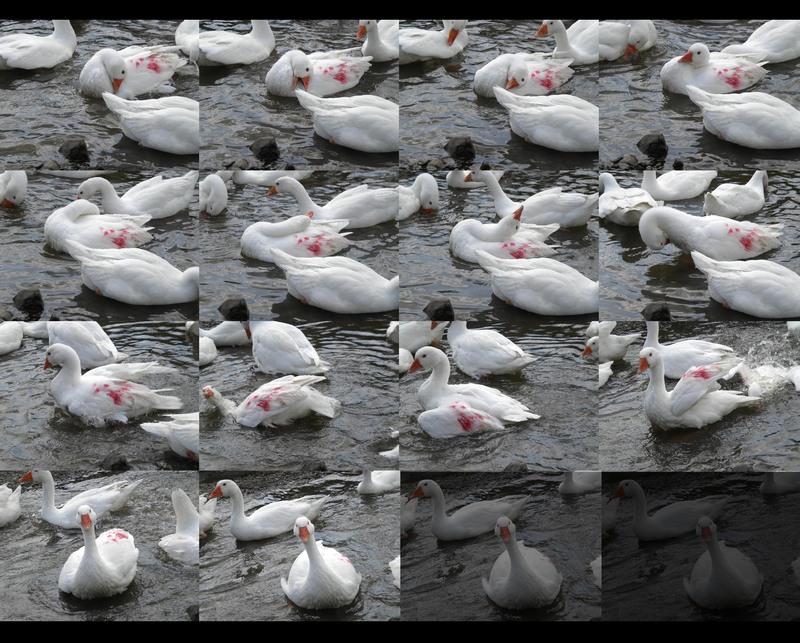 If one shrieks a bit louder for some reason – someone pecked someone else – the geese start shrieking. They have been hanging around the trailer since the goslings arrived. I’m sure they know that the goslings are theirs. They have antibiotics in their water because I was afraid they were starting with pneumonia – they were gulping a lot, but none are now showing any signs of that. The pictures are terrible, but that’s because they’re taken in a trailer under a false roof. Not because I’m the world’s worst photographer. I just happen to be that too. The trouble with writing about animals this year is the lack of photos. People want pictures! Talking about how the goslings poured out of the side trailer door onto the ground while the four geese attacked us (not the goslings, thank goodness) isn’t the same without the visual images. I‘ve got them in my head. Small yellowish birds scurrying through the door and landing or bouncing two foot down, then rushing away; rescued and thrown back into the trailer, only to come scuttling out again. A goose wheeling and flapping and screeching, dancing round a disorientated gosling, getting hold of my waterproof chaps and not letting go. Utter chaos. Nothing seems to be physically hurt, but it remains to be seen for now. There are a few illnesses they can get very quickly after being stressed. One or two of them are gulping a bit, so it’s off to the vet tomorrow for me – there’s an antibiotic powder we can put in their water. 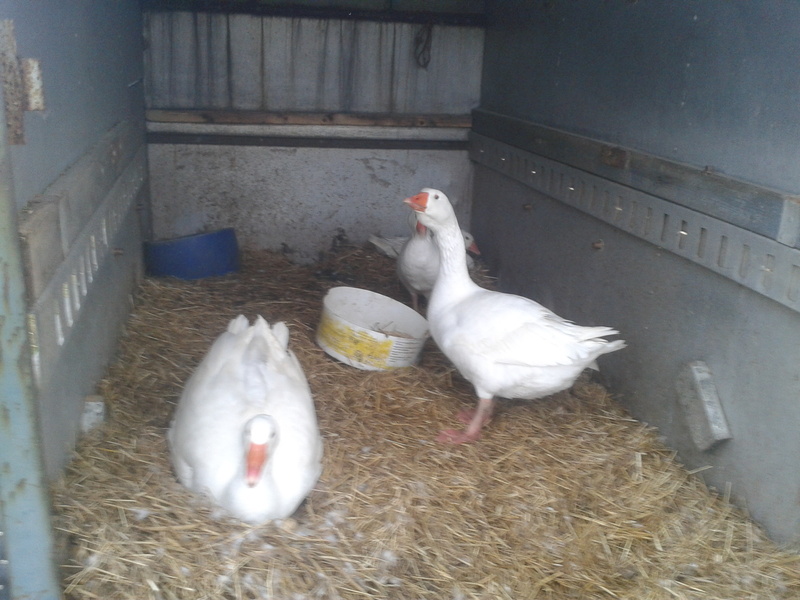 The goslings were transported together in two open tubs, in as unstressful a way as possible. When we tipped them gently into the trailer we didn’t expect them to come rushing back out through the door. We’ve now put a curved rubber ‘wall’ at both ends of the trailer which protects them from the doorway, and also helps to prevent them accidentally suffocating one another in a corner. No corners is apparently safer. I suspect they’re afraid of the dark, so we left them a torch on all night. And no, no pictures. Certainly not while juggling goslings. It wouldn’t be fair. 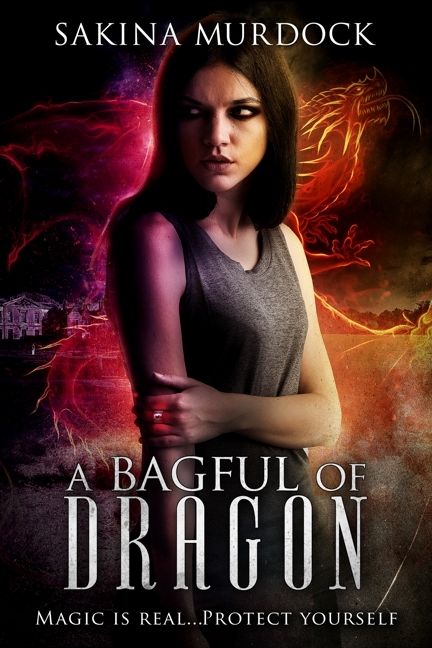 You wouldn’t want your picture taken and flashing lights in your eyes on the most terrifying night of your life. The geeses are twats. That is the only explanation. Not only did Goosey not love her gosling once it was hatched, she left it cold in the nest, while she sat on Blueleg’s nest … with Blueleg … so the gosling died before it dried out – just a piece of scruffy yellow fluff in the bottom of the nest, and its mate got cold and died before even breaking out of its shell. I chased the two geese off the remaining nest, stole their eggs and took them to be incubated. I believe they’re due to hatch now, but there’s no sound coming from them; Himself says he thinks they’re due this weekend or next week, so in the incubator they will stay for another 10 days. 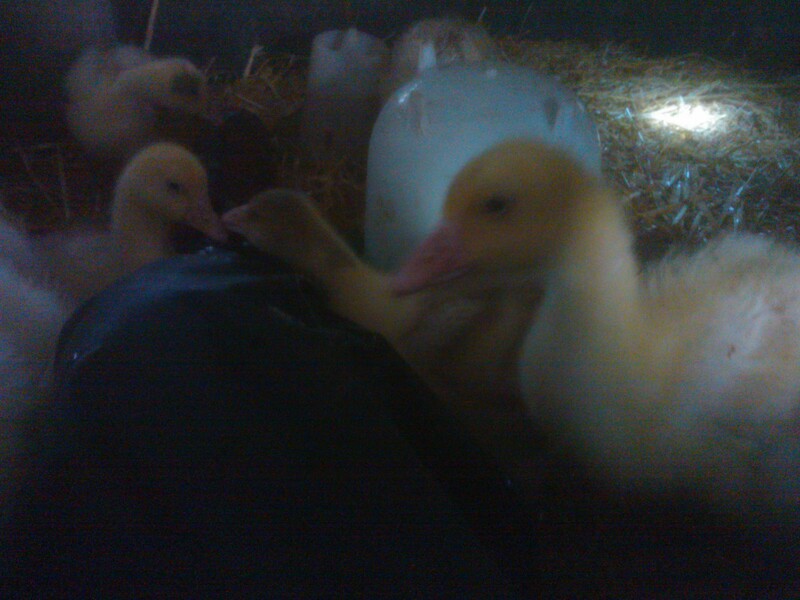 I trusted Goosey to look after them, but she let everyone down; me, herself, and her goslings. It’s like they don’t know what to do with them, but other geeses manage it, so why can’t they? We must have just been lucky with the goose last year. It was sad that we lost her goslings to a predator within 4 days. She looked after them as best she could. Blueleg was insistent that she didn’t want to leave the nest and kept coming back until I put her out the side trailer door, but I just don’t believe her now. All their protestations are worth nothing in the face of two dead goslings. Lessons learned: when a goose starts sitting on a nest, pen her in so that she doesn’t get distracted; don’t let two geese sit with nests in the same pen. 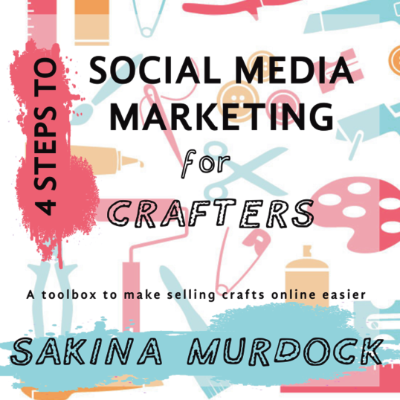 They have a social nature, so when they’re presented with a problem, they solve it in social ways. 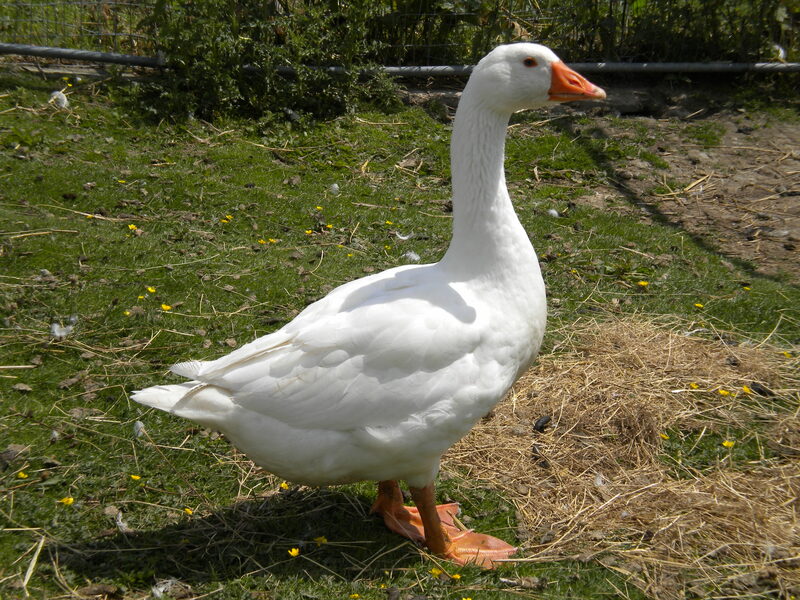 For example, a goose is bored, sitting on her nest. So she gets someone else to sit for her for a while. After a few days that one decides she wants a nest of her own. But she’s not laying any more, so she finds some eggs and builds her own nest round them. Cutting off that opportunity to solve problems means that they are stuck where they are. It feels cruel in a sense, but its surely for the best. The problem with social solutions is that they become complicated and confusing. I wonder if that can be applied to our societies and politics. The goose trailer is like a flaming soap opera at the moment. Five eggs hurled out of the nest today, two remaining. Presumably something wrong with them. 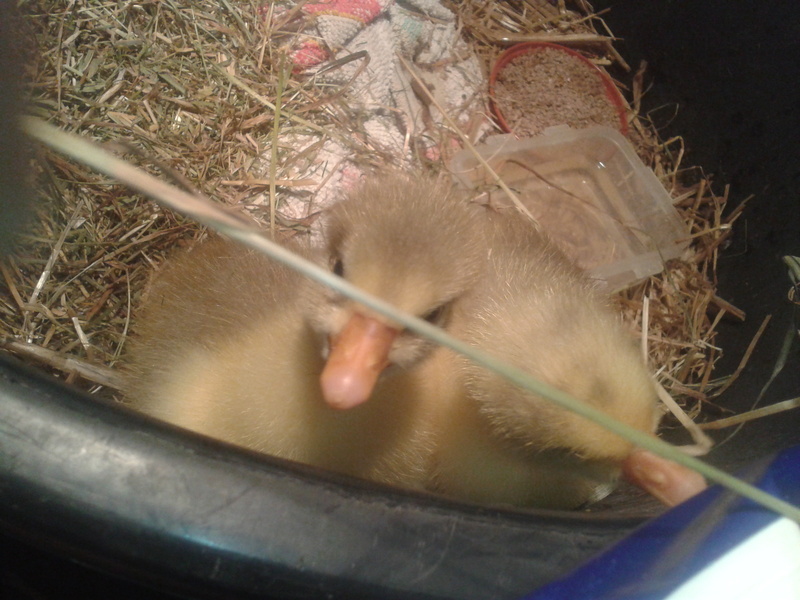 * I put them in a food bowl in the trailer (nothing was happening hatching-wise) chased Goosey off her nest and looked at the two eggs. 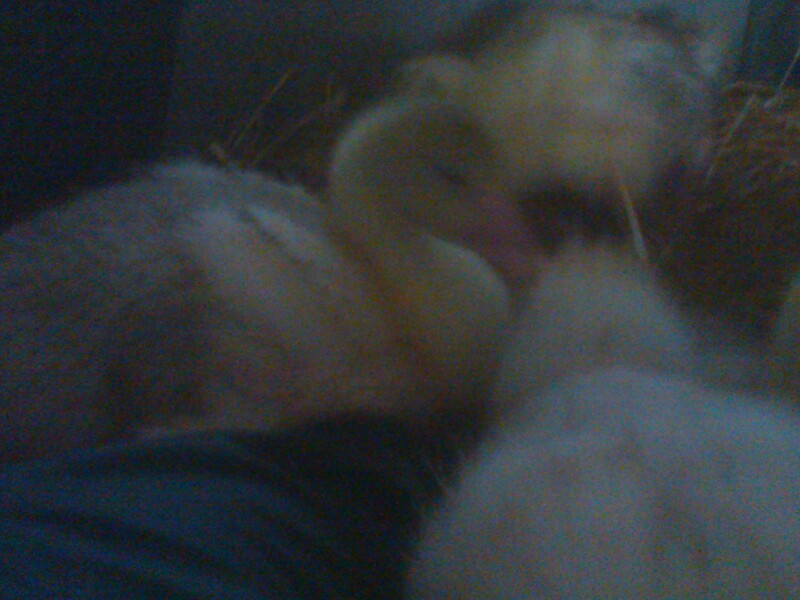 One gosling had pipped its external shell while the other was intact, but both were squeaking. There was a terrible smell in the trailer. I’m not sure it was death exactly; more an olfactory unpleasantness, with putrefaction possibly playing a role. I can still smell it in my hair. The girls with their protector in the centre. Possibly the worst photo in the world. The silly brainless goose (whom Himself’s son has called Hooter) strolled up to the eggs in the bowl. She messed with them for a minute or so, and had a short ‘conversation’ with Goosey who got off her nest and went outside. Hooter sat on the nest. Half an hour later two eggs were on the trailer door: the live gosling eggs. I put them back in the nest, shooed Hooter away and made Goosey come in. It would be a shame to lose them at such a late stage. From there The Fear set in. 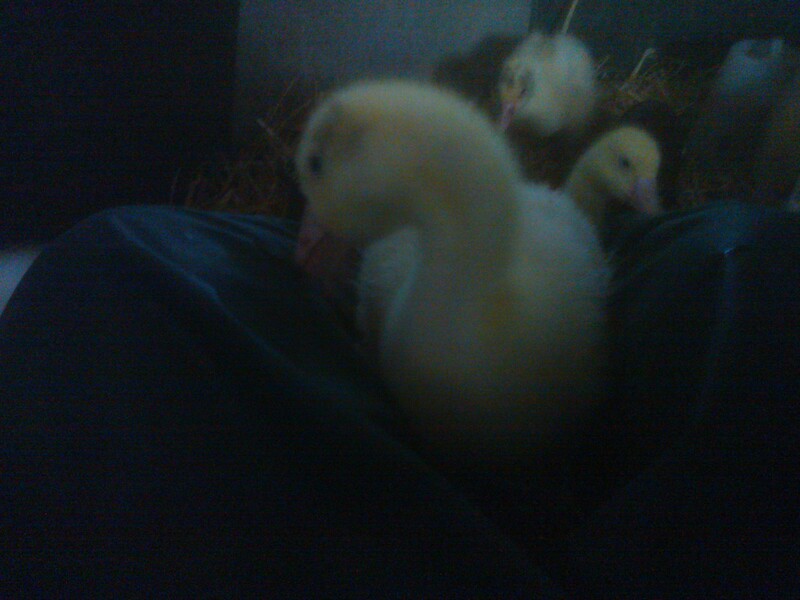 Should I have taken them off Goosey and incubated them? Or let her look after them herself. From now she only has up to around 24 hours left to keep the eggs warm, and I’m sure she’ll love them when they’re hatched. But now I’m uncertain that I can trust her to look after them till they’re out. 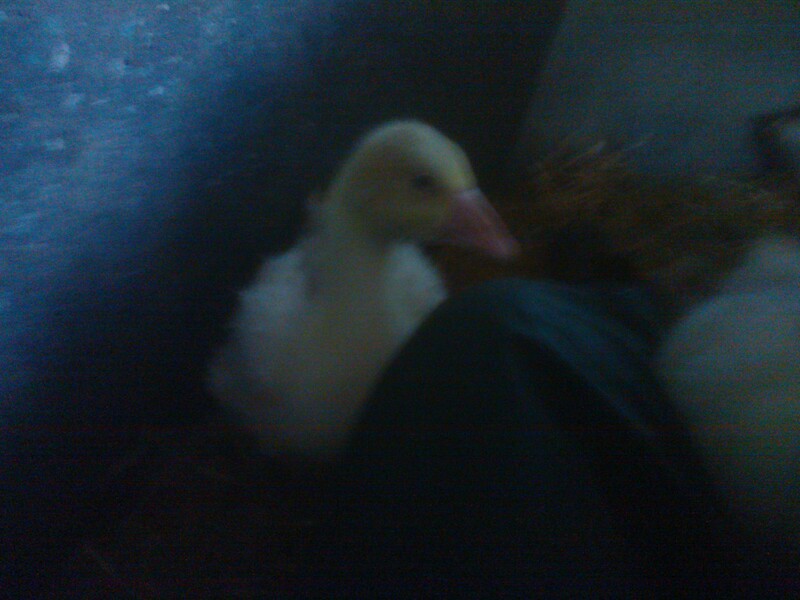 I am also afraid that either Gander or Hooter might harm the goslings once they’re hatched. Hooter has already had a go, after all. And I found egg shell stained with yellow yolk and a smudge of blood outside the trailer. Who knows what happened to that one? A reluctant optimist, I covered every airhole and the space above the rear door with chickenwire, cable ties and binder twine holding it down. I kicked out Gander and Hooter and closed the trailer door. Those two can stop out till the eggs hatch. It seems a bit mean on Gander and I was hoping he would help protect the goslings, but I can’t be sure what he will do. I’d rather he met them in a relatively controlled environment. Male geese do kill offspring that isn’t theirs, and although they are definitely all Gander’s, I don’t know how he can know. What if he gets it wrong and thinks that some of them aren’t his? Himself and son put an old trailer canopy out for Hooter and Gander for a bit of protection, and the weather’s not too awful at the moment. They’re inside the geese compound too, which we fox-proofed a couple of years ago. With the door shut, the nesting geese are kept together, without distractions (wandering off is pointless in a 6 x 8 foot trailer) and Hooter’s loose wires won’t affect the hatchlings. (She probably put the eggs out because she was uncomfortable on the nest with them there. Brainless, see?! Why did she think the other two were sitting on their nests?). My plan is to keep the two Mama Geese in the trailer until the goslings are old enough to go outside without getting cold, then use the large goose (chickenwire) coop we made last year (and only used for about a week). I’ll give it a wire roof to protect them from the sparrowhawks and crows, and fix it to the trailer so they can be indoors or out as they please.Let’s hope there are new goslings in the morning. The sooner the better. *We looked inside the shells; three were infertile, one was rotten, and one contained a dead gosling.